They've been sold, re-formed, moved and just about anything else you can think of. Needless to say, these guys are not messing around. 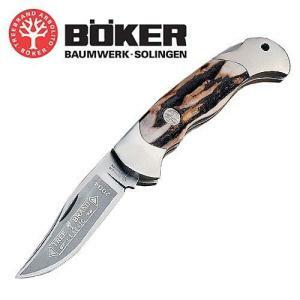 Boker is also known as "Tree Brand" due to the tree in their logo and the chestnut tree that neighbored their original property in Solingen, Germany. This knife is a distinctive one, what with its stag bone contoured handle with curved bolster. The blade is 3.125 inches of 440C stainless steel. 440C, as you may already know, is much better quality than 440A or 440A's identical twin known as just "440". It measures 4.125 inches when closed and includes a leather belt sheath.